Mahindra Comviva, the mobility solutions arm of IT services major Tech Mahindra, has ventured into the B2C commerce space with a new discovery app for local deals. Christened Zerch, the app aggregates deals/offers from nearby merchants in categories such as food and beverages, spas and salons, and apparels, among others. "Zerch approaches the problem of discovery and fulfillment of offers/deals (from offline stores) from a merchant's perspective. It helps brick-and-mortar stores achieve higher footfall, increased rates of transaction and greater revenue," Srinivas Nidugondi, Senior VP and head (mobile financial solutions) at Comviva Technologies Ltd, which runs Mahindra Comviva, said. Zerch claims to have about 1,500 offline stores across Bangalore and Delhi-NCR on its network. It will onboard about 5,000 merchants by March 2016. 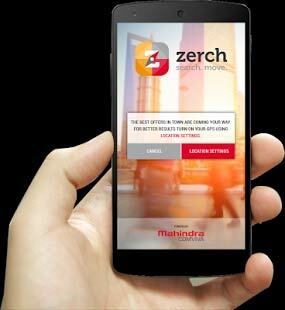 Zerch facilitates close to 1,000 deals every week on the Android and iOS platforms, Nidugondi told Techcircle.in. Zerch would compete with deals apps such as Little, promoted by Zovi.com's founders Manish Chopra and Satish Mani and backed by Paytm, Niffler (acquired by personal assistant app Helpchat) and Perksmap (co-founded by Koovs.com co-founder Rajesh Kamra) among others. Also, Times Group-promoted discount aggregator Coupondunia has started offering offline deals to consumers while Helion and Accel-backed MySmartPrice.com, a product discovery and online price comparison shopping platform, added an offline price comparison service for mobile stores early this year. The Indian market for online vouchers and discount coupons is a heavily fragmented one. Once a hot space, it had fallen off investors' radar, barring an odd deal here and there. However, there seems to be renewed interest as indicated by a recent management buyout styled transaction, in which NASDAQ-listed deals aggregator Groupon Inc ceded majority stake in its India unit (renamed as Nearbuy post the deal) to venture capital firm Sequoia Capital and the top management of Groupon India. In October, Little Internet Pvt Ltd, which owns the deals discovery app Little, acquired Chandigarh-based curated deals marketplace Trideal for an undisclosed amount. Mahindra Comviva largely positions itself as a content, mobile commerce and data services company. One of its major products is Mobiquity, which connects banks, payment gateways and merchant websites to deliver a range of financial services. Mahindra Comviva is targeting payments bank and small finance bank licensees forMobiquity. In fact, Tech Mahindra was one of the 11 entities to get the Reserve Bank of India's nod for starting a payments bank. Mahindra Comviva, in which IT major Tech Mahindra holds a 67 per cent stake — the rest is held by Bharti Group (20 per cent) and private equity firm WestBridge Capital (13 per cent) — has presence in 90 countries.